While I had always enjoyed creating one-of-a-kind, crocheted items for friends and family, when I decided to expand and offer my products at the retail level there were many challenges to overcome, not the least of which was finding a label manufacturer who could help me create my name brand. Not only was I at a loss when it came to design ideas, fonts, colors, fabrics, etc., I wasn’t even sure if I could afford a custom garment tag, being convinced that huge quantities and a large amount of capital would be required to place an order. So I tentatively began the daunting quest where everyone does I suppose… I went online. Thus, my search proved rather fruitless when I was unable to locate a label manufacturer who offered customized services, superior materials, and quantity levels I could afford. Significantly disheartened, I resolved to focus on other areas and simply hand-stitch my company name, discretely, on any forthcoming sales until my business cash flow increased. Obviously, I wasn’t in any position to shell out anywhere near the eight to twelve hundred dollars (according to the two most promising sites) required for a custom clothing label. Some time later, through a series of providential circumstances, I was introduced to Linda Bryan, owner and operator of Thirty Seven West. A small business owner like me, with lifelong experience in the garment label industry, she could understand the challenges I was facing, and explained that for those reasons, she had created Thirty Seven West. As an independent manufacturer, she was able to utilize her expertise to provide constructive solutions for my branding dilemmas. 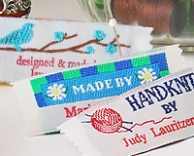 I found that she offered a great variety of pre-designed woven labels, in small quantities, perfect for needle crafters and emerging entrepreneurs like me. For under forty dollars I could place my company name on a woven label that sported a range of quality designs with elegant motifs, or whimsical themes, and that featured creative fonts and phrases like, “Knitted by”, “Hand-Stitched by”, and “Just for You”. However, since my creations were relatively expensive, I didn’t want to have to change my brand label at a later date to better reflect my company’s image and style, so we discussed her customized label options. She offered an excellent range of fabrics, including super soft cotton labels, luxurious damask, and many others. Knowing absolutely nothing about the technical aspects of garment label design, folds, sewing allowances, which fabrics were best with which colors, etc. and contributing only my name and slogan, Linda, and her dedicated staff of professionals, diligently worked to create a custom clothing tag that was elegant in both form and function, in a quantity and at a price I could afford. Her extreme attention to detail, open communication throughout the process, and keen insights were incredible, and what I had taught myself to believe were unattainable and non-existent. When beholding my finished brand label, I felt that my tastes and wants were fully considered, and that she had not only met my expectations, she had exceeded them in every way. Therefore, if you’re looking for an opportunity to add distinction to your creations with a customized clothing label, or would simply like to add a finishing, personal touch to your handmade gifts, choose Thirty Seven West. In this humble crafter’s opinion, the level of service is unsurpassable, and the quantities and price are manageable on any budget.